(CNN)For the first time, two neutron stars in a nearby galaxy have been observed engaging in a spiral death dance around one another until they collided. What resulted from that collision is being called an "unprecedented" discovery that is ushering in a new era of astronomy, scientists announced Monday. "We can now fill in a few more tiles in the jigsaw puzzle that is the story of our universe," said Laura Cadonati, deputy spokeswoman for the LIGO Scientific Collaboration and professor in the school of physics at Georgia Tech. The collision created the first observed instance of a single source emitting ripples in space-time, known as gravitational waves, as well as light, which was released in the form of a two-second gamma ray burst. 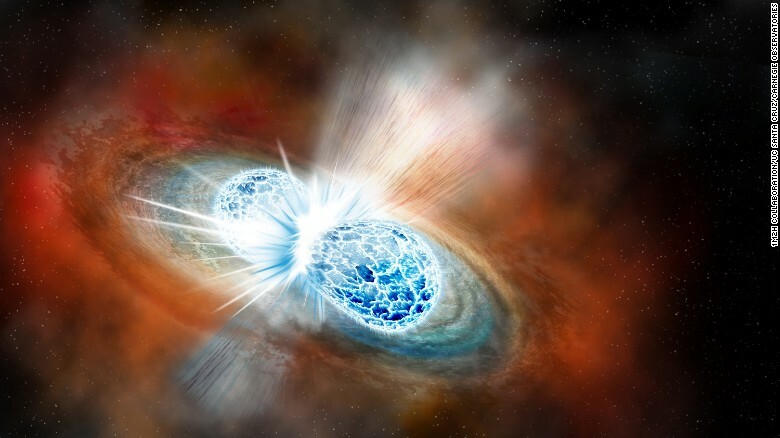 The collision also created heavy elements such as gold, platinum and lead, scattering them across the universe in a kilonova -- similar to a supernova -- after the initial fireball. News conferences were held around the world and a multitude of research papers were published Monday to detail the discovery, which was captured by space and Earth-based telescopes on August 17. These papers and conferences include representatives for the thousands of scientists, 70 observatories and gravitational wave detectors LIGO and Virgo that participated in one of the most-observed and -studied astronomical events of our time. One paper includes thousands of authors making up 35% of the global astronomy community. This discovery of two neutron stars colliding to create the same type of waves, in addition to light, allowed astronomers to study gravitational waves in a new way. The signal lasted for 100 seconds, providing them with even more data and insight. It revealed that light and gravitational waves travel at the same speed. "Now, we can use this type of event to measure the rate of expansion of the universe," said Marcelle Soares-Santos, assistant professor at Brandeis University and research associate at the Fermilab Center for Particle Astrophysics. Vicky Kalogera, leading astrophysicist for the LIGO Scientific Collaboration, compared previous detections of gravitational waves to experiencing a thunderstorm in a room with no windows -- only hearing the thunder. This detection was like experiencing a storm in a room with windows, changing everything scientists thought they knew. Kalogera is also co-founder and the current director of CIERA, the Center for Interdisciplinary Exploration and Research in Astrophysics, an endowed research center at Northwestern University. "The impact for astrophysics is equivalent to the transition from watching a set of still pictures in black and white to sitting in a 3-D-IMAX movie theater: It is a multisensory experience of the universe," Cadonati said. Theories and mysteries were tested and revealed in this rare observation. Events like this happen less than 100 times per million years in a galaxy. But the LIGO and Virgo detectors will become more sensitive in the future to look for similar events in tens of millions of galaxies. "This was the culmination of a number of different areas in astronomy and physics, coming together in one amazing event," said Tony Piro, the George Ellery Hale Distinguished Scholar in Theoretical Astrophysics at the Carnegie Observatories. In a collaboration with UC Santa Cruz, Carnegie Observatories were the first in the world to discover this event. They were able to collect early data just before, during and after the collision and study it in more detail. The discovery confirms that gamma-ray bursts can result from the collision of neutron stars, as well as that heavy elements are created as a result of violent collisions between stars. It confirms what these neutron stars look like when they collide. And it confirms that gravitational waves and light can happen together. "This singular event finally solves all these problems, bringing together all these mysteries at once," Piro said. Neutron stars are the smallest in the universe, with a diameter comparable to the size of a city like Chicago or Atlanta. They are the leftover remnants of supernovae. But they are incredibly dense, with masses bigger than that of our sun. So think of the sun, compressed into a major city. Now, think of two of them violently crashing into each other. "This is more energy than has been released by the sun during its entire life, and this was released during just tens of seconds as the neutron stars (spiraled) together," Piro said. How did heavy elements end up on Earth? People tend to think that all of the elements on the periodic table form in nature, such as at the centers of stars, but it isn't true, Kalogera said. That occurs only up to the level of iron. Anything heavier than that can't be formed naturally; it results from violent collisions of dense stars or explosions during the collapse of massive stars. That was what astronomers witnessed during this particular collision. Those heavy metals were then shot far away from the collision. These collisions are responsible for half of the heavy elements in the universe. The heavy elements are dispersed in the gas in galaxies, which settles down and condenses to form stars and discs around stars. That forms planets, and the planets have gold in them -- which we mine on Earth, Kalogera said. In order for these neutron stars to form in the first place, there was a supernova when the universe was young: about 2 billion years old. For 11 billion years after, these stars danced around one another until they died in the final collision. The initial supernova that created the neutron stars also created elements up to the weight of iron. This latest collision of the neutron stars, resulting in a kilonova, created all of the elements heavier than iron. So the entire life cycle of these stars created every element represented on the periodic table, according to Edo Berger of the Harvard-Smithsonian Center for Astrophysics. How did so many astronomers witness the same event? Science is a team sport, Kalogera said. When Virgo and LIGO, working together for the first time in a collaboration of scientists across the world, detected the signal of the gravitational waves in August, an alert was sent out to observatories across the world. They embarked on a quest to pinpoint where in the sky the signal was coming from so they could observe it in detail, especially when they realized it was accompanied by a gamma-ray burst. They saw the bright blue explosion, which faded to a deep red. Astronomers, physicists, engineers and other scientists using multiple space and Earth-based instruments made this possible, from detection to followup observations. And although the collision itself happened 130 million years ago, because of its distance in light-years, we witnessed it from Earth on August 17. Any scientist involved in the seconds, days and weeks after this detection will admit that they've slept little since. To them, it is a once-in-a-lifetime discovery. The observation also came days before the total solar eclipse, so it's been hard for them to keep quiet about the discovery. Expect papers and more findings to be released in the weeks, months and years ahead. Any big discovery leaves new questions in its wake, and this one is no exception. Astronomers will continue to study the data obtained in this discovery. They want to know what the merger of these two stars created, either a black hole or a bigger neutron star. The latest research has study authors leaning towards a black hole. They also want to know why the gamma ray burst was faint, given that it occurred in a neighboring galaxy and should have appeared much brighter. "The picture most people have is that the gamma-ray burst was faint because it was viewed off-axis," Piro said. "The gamma-ray emission is a highly beamed, so if you are not looking right down the barrel of the relativistic jet, then you won't see the full power of the burst." And of course, the astronomers want to observe more events like this to know how rare it is.